We normally go caching on a Saturday but the weather was looking abysmal so we opted to go a day earlier this week as it was looking much more promising. We’d decided to try for the caches that were put out for the Piratemania event in the Peak District last week. 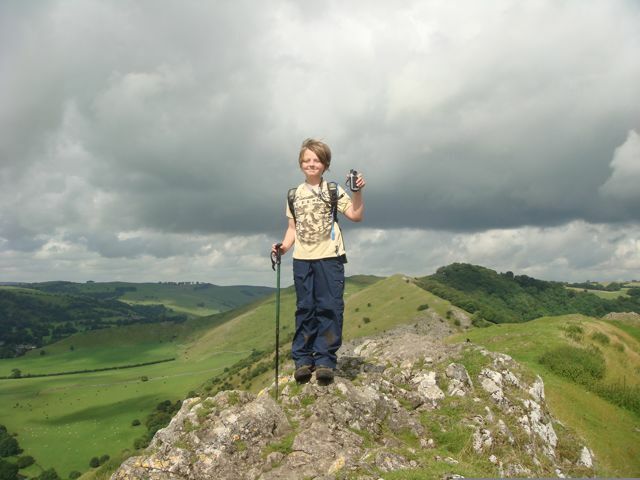 There is no easy way to get to where they were in Dovedale from home, so Isaac guided us using Memory Map using the most obvious direct route, which involved quite a few narrow lanes. All too soon, we rounded the brow of a hill and saw Thorpe Cloud standing right in front of us. This was to be our starting point for the day. We made our way to the official car park and got ready for our walk around the SOTL caches. As we set off, we noted the nice looking ice cream shop at the side of the car park and agreed that if we managed to find all the caches in the series, we’d treat ourselves at the end of the walk. We set off down the path towards Dovedale and had intended to use the stepping stones to get to Thorpe Cloud but they were under water today and shut. We thus used the bridge nearer the car park and found a path heading along the south side of the Cloud. This path then headed up and in the right direction for the top. The elevation gain was slow so we opted for the more direct route straight to the top. As we saw the rocks at the summit, Isaac was convinced it was a false summit but it was not and we were soon sat there admiring the absolutely fabulous views. Next, we headed down the north side of the Cloud and then onto the main path along Dovedale to find the rest of the caches. It was muggle central around here today which made finding some of the early caches interesting to say the least. The further we got along the path, the less muggles there were so the caching did get much easier :-). The only other thing to note along this stretch of the walk was a tricky cache called Beefsalter, which had had a ton of DNF’s. We were not confident of a find here but went to have a look anyway. GZ was in dense summer growth and there was no sign of a hint item anywhere, despite lots of evidence of other cachers searching the area. I mentioned to Isaac that perhaps the cache was on the other side of the river as I bet getting accurate co-ords with the steep rock walls around here is not easy. All the rest of the caches on the walk were on the other side of the river and we’d just walked past the one and only bridge, so my theory made a lot of sense. We backtracked to the bridge and walked along to opposite where the co-ords were pointing to and sure enough, there was a hint item with a cache behind it – result! The path from here northwards was awful – part of it was underwater and we had to wade along it, the rest was very muddy and extremely slippery. We were glad to finally get onto the road at the far end and then start the walk back to the Jeep along the paths where the rest of the caches were. The rest of the series was straightforward enough and very enjoyable, with some beautiful Peak District views all around. As we arrived back at the Jeep, we just had to pop and get one cache we could not do earlier due to the stepping stones being closed, before we treated ourselves to the ice creams we’d promised ourselves earlier :-). Next stop was the GOTN series. Not much to report here as they were all pretty easy finds apart from the first one. All the caches in the series did not have any hints and the first one was nowhere to be found. There was a very obvious dry stone wall but caches are not allowed in these so we did not look there. On the point of giving up, we spotted something in a previous log that implied the cache was in the dry stone wall and indeed it was. The rest of the GOTN series passed quickly, with more nice walking and views. We then decided to head over to Parwich and tackle the small series there. We started off with a cache on a hillside with nice views over the village. As we walked up to GZ, we went past two separate metal detector guys busy at work. I wonder what they are expecting to find here? All the caches were easy finds, but we had to leave #3 for another day as it had just started raining and it was a longer walk. We’d have been up for it earlier in the day, but it was nearly time to go home and we did not fancy getting wet now. We thus started to head off home, but took in a Guess Who? cache at a ford in Tissington. We’re more used to seeing Guess Who? caches near where they live in Oswestry so were surprised to see one here. A quick scout around so revealed the nicely hidden cache. We opted for a different route home, via Ashbourne and then onwards to the A50 at Uttoxeter and took in a quick cache called Dad’s 60th on the way past. A nice easy find once we’d found the right path. We laughed at the clue, which was something like “opposite a white shed”. We found the cache but it’s opposite a black shed. Either someone has painted the shed or the cache owner is having a laugh! As we skirted Ashbourne, we spotted an unexpected drive-by cache by a roundabout as we were passing so it would have been rude not to stop and find it. 37 finds for the day today and some really satisfying walking in the lovely Peak District. We always say we’d love to do more caching in the Peak District, but there just is not enough caches to come and find.